Six more workers at the Hanford nuclear site in Washington state were taken to a medical clinic for exposure to radioactive fumes, bringing the total number of affected workers to 26. Fumes have reportedly been leaking from waste tanks since last week. The six workers were outside the tank farms. Three reported smelling suspicious odors, and three others requested medical evaluations because of odors last week, according to The Tri-City Herald. The Hanford nuclear site holds radioactive waste stored in underground tanks that is left over from the past processing of plutonium used in the nation’s nuclear weapons program, beginning with the Manhattan Project. The vapors are associated with the chemical portion of the waste. The latest incident of sickness brings the total number of employees evaluated for possible exposure to chemical vapors to 26 since Thursday. All 26 have returned to work, but are concerned about long-term health problems. The Hanford site is on the Columbia River in East Washington. It stores 56 million gallons of radioactive chemicals, two thirds of which is radioactive waste stored in tanks built between the 1940s and 1970s. Last month, Hanford officials announced that several thousand gallons of radioactive waste had leaked from the site’s primary tank. “During routine filter inspections, higher than normal readings for contamination were found on filter paper installed on a continuous air monitor for Hanford’s double-shell tank AY-101 annulus. While these readings were higher than normal, they were well below the alarm level,” Hanford Contractors and Energy said, according to Washington River Protection Solutions. The odors are suspected to have come from the transfer of that waste. Transfer work has stopped while new equipment is being installed. “It is an environmental disaster,” ecologist Tom Carpenter told RT. According to a statement released on Tuesday evening, Washington’s attorney general is exploring pursuing further legal options to keep workers safe from chemical vapors. 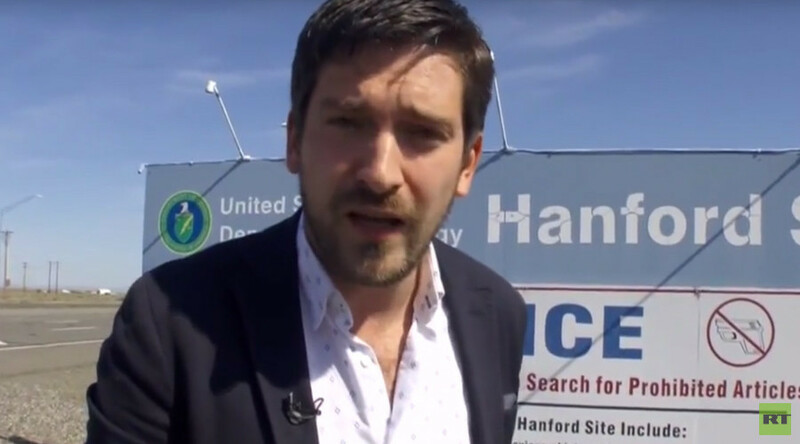 “The events of the past several days are a disturbing illustration of why I filed a lawsuit against the federal government to protect Washingtonian who work at Hanford,” said Attorney General Bob Ferguson. Ferguson filed a lawsuit seeking better chemical vapor protection for workers against the Department of Energy and its Hanford tank farm contractor last September. “What’s happening at Hanford isn’t right, and I am exploring further legal options to keep our workers safe,” he said. Ferguson said that he had called on President Barack Obama and US Energy Secretary Ernest Moniz to get personally involved in the case.